Tilapia is a very mild, moist and flaky fish. I love to bake it in the oven for an easy, fast and tasty meal. I’ve adapted a recipe my mother always made that my kids couldn’t get enough of. I know Linda has also used and adapted this dish for her family too. Make this fish for your family and all you’ll hear is… May I have another? Preheat oven to 325 degrees. Toast sourdough bread crumbs in a sauté pan until just toasted. Do not burn. Place 1 stick of butter on a baking sheet and place in heating oven. When butter is melted, remove from oven. Dredge each piece of Tilapia through the melted butter on both sides and set aside. Cool bread crumbs and add Parmesan cheese. Mix together until the cheese and bread crumbs are incorporated. 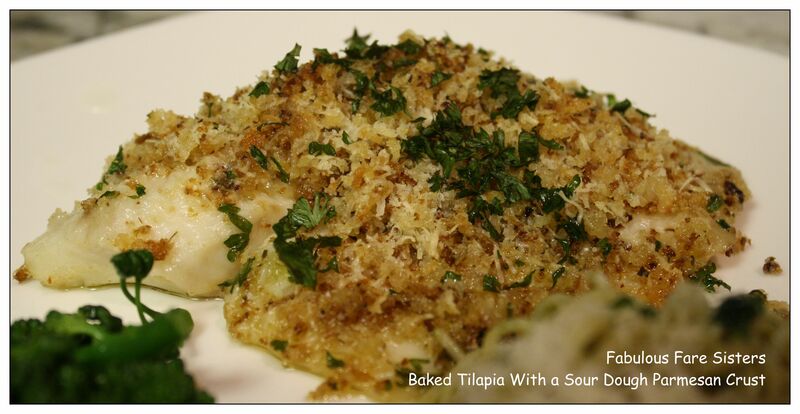 Return Tilapia back to the cooking sheet and generously top each piece with the bread cheese mixture. Melt remaining 1/2 stick of butter and distribute evenly over the fish. Top each piece with chopped parsley and pepper. Bake at 325 degrees for about 18-20 minutes. Remove from the oven and serve with lemon slices. It was so good that I’m making it again tonight for guests. Glad to have you on board. Two of my favorite things butter and sour dough. Let’s say nothing comes close to butter. Excellent idea with the sour dough bread crumbs! BRAVO! Thanks! Our mom makes it with sateen crackers. I love Tilapia recipes. This is a great one! Looks great! Such a good weeknight dinner idea. Never used bread crumbs from sourdough. Would love to try. Looks amazing!! It is also good with rye. The sour dough breadcrumbs are a new twist. Looks delicious. I like it with rye bread too.